Microglia are the resident macrophage-like population in the CNS. Microglia remain quiescent until injury or infection activates the cells to perform effector inflammatory and APC functions. Our previous studies have shown that microglia infected with a neurotropic strain of Theiler’s murine encephalomyelitis virus secreted innate immune cytokines and up-regulated costimulatory molecules and MHC class II, enabling the cells to present viral and myelin Ags to CD4+ T cells. Recently, TLRs have been shown to recognize pathogen-associated molecular patterns and initiate innate immune responses upon interaction with infectious agents. We examined TLR expression on brain microglia and their functional responses upon stimulation with various TLR agonists. We report that mouse microglia express mRNA for all of the recently identified TLRs, TLR1–9, used for recognition of bacterial and viral molecular patterns. Furthermore, stimulation of quiescent microglia with various TLR agonists, including LPS (TLR4), peptidoglycan (TLR2), polyinosinic-polycytidylic acid (TLR3), CpG DNA (TLR9), and infection with viable Theiler’s murine encephalomyelitis virus, activated the cells to up-regulate unique patterns of innate and effector immune cytokines and chemokines at the mRNA and protein levels. In addition, TLR stimulation activated up-regulation of MHC class II and costimulatory molecules, enabling the microglia to efficiently present myelin Ags to CD4+ T cells. Thus, microglia appear to be a unique and important component of both the innate and adaptive immune response, providing the CNS with a means to rapidly and efficiently respond to a wide variety of pathogens. Microglia are macrophage-like cells resident within the CNS, which can perform APC and proinflammatory effector functions following activation. Microglia are derived from bone marrow stem cells and populate the CNS early during development and remain in the CNS as the resident macrophage population (1). These cells are quiescent in the CNS, unable to perform effector and APC functions until activated by injury or infection, and have been suggested to represent the first line of defense for the CNS, which normally lacks professional APCs until they are recruited to the CNS by inflammatory stimuli (2, 3). Multiple sclerosis (MS)3 is a human autoimmune demyelinating disease, the initiation of which has been suggested to occur secondary to infection (4). Activated microglia have been shown to be present within demyelinating lesions and to phagocytize myelin debris and express MHC class II and costimulatory molecules, suggesting microglia may play an important role in the pathogenesis of MS (5). In vitro studies have shown that microglia can be activated by proinflammatory cytokines to become efficient APCs capable of activating CD4+ T cells (5, 6). Furthermore, our previous studies have shown that microglia can be persistently infected with Theiler’s murine encephalomyelitis virus (TMEV) (6). TMEV is a natural mouse pathogen that causes an autoimmune demyelinating disease in mice that is associated with a persistent infection of the CNS, predominantly in CNS-resident microglia and CNS-infiltrating macrophages (7, 8). Chronic TMEV-induced demyelinating disease in SJL mice is dependent upon CD4+ T cell response to myelin epitopes, most significantly, proteolipid protein, PLP139–151, and serves as an animal model for human MS (9, 10). Thus, microglia may play an effector role during viral infection of the CNS, which suggests a critical role for microglia in the inflammatory response in autoimmune diseases such as MS. The innate immune response is the initial Ag-nonspecific response to a microbial infection that results in the rapid production of chemokines and inflammatory cytokines. TLRs are used by cells of the innate immune system to recognize pathogen-associated molecular patterns (PAMPs), structures expressed by various classes of microbes that are not expressed by eukaryotic organisms. Currently, 10 TLRs have been identified in humans and 9 in mice, TLR1–9 (11). TLR2 associates with TLR6 to recognize triacyl lipopeptides from bacteria, which include peptidoglycan (PG) (12). TLR3 recognizes dsRNA produced during virus replication (13), while TLR4 binds to LPS from Gram-negative bacteria (14, 15). TLR9 recognizes unmethylated CpG DNA primarily found in bacteria (16). Upon engagement of the TLRs, TLR signaling ultimately leads to the induction of NF-κB, ultimately leading to transcription of chemokines, proinflammatory cytokines, and up-regulation of cell surface molecules involved in the initiation of adaptive immune responses to pathogens. The current study was designed to determine the potential role of microglia in innate and adaptive CNS immune responses by determining their TLR expression pattern and their ability to be functionally activated by various TLR stimuli. The results show that murine microglia express the entire complement of TLRs, TLR1–9. Stimulation of quiescent microglia with various TLR agonists, including LPS (TLR4), PG (TLR2), polyinosinic-polycytidylic acid (poly(I:C)) (TLR3), CpG DNA (TLR9), and infection with TMEV, activated the cells to up-regulate unique patterns of innate and effector immune cytokines and chemokines. In addition, TLR stimulation up-regulated MHC class II and costimulatory molecules, enabling the microglia to effectively present myelin peptide to CD4+ Th1 cells. These data suggest that microglia play a key role in both innate and adaptive immune responses, providing the CNS with a means to rapidly and efficiently respond to a wide range of pathogens. Pregnant SJL/J mice (15–17 days) were purchased from Harlan Labs (Bethesda, MD). Mice were housed in the Northwestern University animal facility according to University and National Institutes of Health animal care guidelines. Neonatal mice, age 1–3 days, were used for the microglia isolation. Myelin PLP peptide, PLP139–151 (HSLGKWLGHPDKF), was purchased from Peptides International (Louisville, KY). The amino acid composition was verified by mass spectrometry, and purity was assessed by HPLC. Mixed glial cultures were maintained in DMEM-F12 (Sigma-Aldrich, St. Louis, MO) supplemented with 10% FCS (Sigma-Aldrich), 6 g/L glucose, 2.4 g/L NaHCO3, 0.37 g/L l-glutamine (Invitrogen Life Technologies, Gaithersburg, MD), 100 U/ml penicillin, and 100 μg/ml streptomycin (Invitrogen Life Technologies). Microglial cells were cultured in DMEM (Sigma-Aldrich) supplemented with 20% FCS, 2 mM l-glutamine, and 3 ng/ml rGM-CSF (R&D Systems, Minneapolis, MN). T cell lines were maintained in DMEM supplemented with 10% FCS, 2 mM l-glutamine, 100 U/ml penicillin, 100 μg/ml streptomycin, 50 μM 2-ME, 0.1 mM nonessential amino acids, 1 mM sodium pyruvate (Invitrogen Life Technologies), MEM essential vitamins (Invitrogen Life Technologies), 0.1 mM asparagine (Invitrogen Life Technologies), 0.1 mg/ml folic acid (Invitrogen Life Technologies), 0.8% T-STIM (Collaborative Biomedical Research, Bedford, MA), and 0.2 U/ml rIL-2 (Roche Molecular Biochemicals, Indianapolis, IN). Isolation of mixed primary glial cultures from neonatal mice was performed, as previously described (17, 18). Briefly, brains were removed from 1- to 3-day-old neonatal mice, and the meninges were removed. The left and right hemispheres of the brain were gently dissociated in a nylon mesh bag, and the resulting cell suspension was passed through stainless steel screens (Sigma-Aldrich). The cells were resuspended in DMEM-F12 complete medium and were seeded in poly(d-lysine) (Sigma-Aldrich)-coated tissue culture flasks and incubated at 37°C. Following 10–14 days of incubation, microglia were removed from the astroglial layer by shaking the flasks on an orbital shaker for 24 h at 300 rpm. The primary microglia were removed from the flask, resuspended in DMEM complete microglia medium, and seeded in tissue culture plates coated with poly(d-lysine). The immortalized microglial cell line, M4T.4, was derived from primary SJL microglia cultures, as previously described (19). M4T.4 cells were maintained in poly(d-lysine)-coated flasks with microglia medium and were split (1:4) every 2 days by gently removing the cells with versene (Invitrogen Life Technologies). The BeAn strain of TMEV was purified from confluent BHK-21 cells, infected as previously described (20). Microglial cultures were infected with TMEV at a multiplicity of infection of 5 in limited medium. The infected cultures were incubated at 20°C for 1 h with intermittent shaking. Additional medium was added, and the cells were incubated for 48 h at 34°C. Microglia were incubated in the presence or absence of rIFN-γ (100 U/ml) for 24 h, infected with TMEV for 24 h, or stimulated with poly(I:C) (50 μg/ml) (Sigma-Aldrich), LPS (5 μg/ml) (Sigma-Aldrich), PG (5 μg/ml) (Sigma-Aldrich), or CpG DNA (1 nmol/ml) for 24 h. Optimal incubation times and concentrations for TLR stimulation were determined using concentrations from 0.1 to 100 μg/ml and using incubation times of 2–72 h. Optimal incubation times and concentrations were previously determined for IFN-γ and TMEV infection (6). Following the incubation, microglia were lysed, and total RNA was isolated from the cells using SV Total RNA Isolation kit (Promega, Madison, WI). First strand cDNA was generated from 1 μg of total RNA from the microglia using oligo(dT)12–18 primers and Advantage for RT-PCR kit in a final volume of 100 μl (BD Clontech, Palo Alto, CA). Real-time PCR were conducted with the LightCycler-Faststart DNA Master SYBR Green I kit (Roche Molecular Biochemicals). Briefly, 0.5 μM primers, 2 mM MgCl2, 1× FastStart DNA SYBR Green I reagent, and 2 μl of diluted cDNA were combined. The primers were synthesized by Invitrogen Life Technologies: TLR1 (5′-GGACCTACCCTTGCAAACAA-3′, 5′-GGTGGCACAAGATCACCTTT-3′); TLR2 (5′-TGCTTTCCTGCTGGAGATTT-3′, 5′-TGTAACGCAACAGCTTCAGG); TLR3 (5′-TTGTCTTCTGCACGAACCTG-3′, 5′-CGCAACGCAAGGATTTTATT-3′); TLR4 (5′-ACCTGGCTGGTTTACACGTC-3′, 5′-CTGCCAGAGACATTGCAGAA-3′); TLR5 (5′-GCCACATCATTTCCACTCCT-3′, 5′-ACAGCCGAAGTTCCAAGAGA-3′); TLR6 (5′-CCAAGAACAAAAGCCCTGAG-3′, 5′-TGTTTTGCAACCGATTGTGT-3′); TLR7 (5′-GGAAATTGCCCTCGATGTTA-3′, 5′-CAAAAATTTGGCCTCCTCAA-3′); TLR8 (5′-GAAGCATTTCGAGCATCTCC-3′, 5′-GAAGACGATTTCGCCAAGAG-3′); TLR9 (5′-ACTGAGCACCCCTGCTTCTA-3′, 5′-AGATTAGTCAGCGGCAGGAA-3′). Primers for IFNβ, IL-1β, IL-6, IL-10, IL-12, TNF-α, inducible NO synthase (iNOS), MIP-1α, and MCP-1 were previously published (19). Real-time PCR was conducted on Rotorgene 2000 using hot start with cycle conditions, 40 cycles: 95°C, 15 s; 60°C, 2 s; and 72°C, 15 s, followed by a melt from 75°C to 95°C, and a final 72°C extension for 5 min. Quantitation of the mRNA was based on standard curves derived from cDNA standards for each primer pair. Positive and negative cDNA controls were used for each cytokine using cells known to express or not to express the specific cytokine. The fold increase was determined by dividing the quantity of a specific cytokine mRNA from the stimulated microglia by the quantity of that same cytokine mRNA from the unstimulated microglia. Microglia were incubated in the presence of rIFNγ, poly(I:C), LPS, PG, or CpG DNA for 24, 48, or 72 h, and the supernatant was removed from the cells. The supernatant was assayed using LiquiChip mouse 10 cytokine kit (Qiagen, Valencia, CA), as per the instructions. The beads were analyzed on Luminex100 machine (Qiagen), and the cytokines were quantitated based on a set of standards for the assay. Microglia were incubated in the presence of rIFN-γ, poly(I:C), LPS, PG, or CpG DNA for 24 h, or infected with BeAn virus for 48 h. The cells were removed from culture and washed twice with cold FACS buffer (saline with 5% normal goat serum). Microglia were incubated with normal mouse serum and FcR block for 30 min at 4°C and then incubated for 45 min at 4°C with biotin-conjugated Abs specific for Mac-1 (CD11b), CD45, CD40, ICAM-1 (CD54), B7-1 (CD80), B7-2 (CD86), H2Ks (MHC class I), and I-As (MHC class II), or the appropriate isotype control Abs (BD Pharmingen, San Diego, CA). Following Ab binding, the cells were washed and then incubated with streptavidin FITC for 30 min at 4°C. The cells were washed and fluorescence was analyzed on BD Biosciences (San Jose, CA) FACSCalibur. The mean fluorescence shift was determined by subtracting the mean fluorescence of the isotype control from the mean fluorescence of the unstimulated or stimulated microglia. CD4+ Th1 cell lines specific for PLP139–151 were derived from SJL/J mouse lymph nodes, as previously described (6). For the T cell proliferation assays, microglia were cultured in 96-well tissue culture plates (2 × 105 cells/well) and were stimulated for varying times from 12 to 48 h. The microglia were washed twice with medium, irradiated (3000 rad), and cultured with 5 × 104 T cells and 10–50 μM PLP139–151. Although the cultures were run for varying lengths of time, we report peak proliferative responses that occurred in cultures pulsed at 72 h with 1 μCi of [3H]thymidine and harvested and counted at 96 h. Proliferation was determined from triplicate wells for each condition and expressed as cpm ± SEM. The stimulation indices were calculated by determining the fold increase in the cpm in wells containing the peptide (solubilized in PBS) vs wells containing PBS alone. For the T cell hybridoma proliferation cultures, supernatant was removed at 72 h and assayed for IL-2 secretion using the LiquiChip assay described above. Mice express nine TLRs that have been shown to have differential expression patterns on professional APCs, including dendritic cells, macrophages, and B cells, in which the receptor expression and levels vary dependent on the cellular maturation state (12). Microglia have been described as the resident APCs of the CNS, where the cells remain in a resting state until activated by injury or infection. To determine the potential role of microglia in mediating innate immune responses, we determined the expression pattern of TLR1–9 using real-time PCR. As demonstrated in Fig. 1⇓, control (unstimulated) microglia remarkably constitutively expressed all the TLRs, TLR1–9. Next, microglial TLR mRNA expression levels were analyzed following activation with the proinflammatory cytokine, IFN-γ, which has previously been shown to activate APC functions in microglia (6). IFN-γ-stimulated microglia significantly increased expression of TLRs 3, 6, and 9. Stimulation levels were determined by comparing expression levels with those in unstimulated microglia. Increases of greater than 2-fold were considered significant based on analysis from multiple experiments (Fig. 1⇓ and Table I⇓). We have previously shown that microglia are activated upon persistent infection with TMEV to secrete various innate immune cytokines and induced to function as APCs (6). TMEV infection led to increased expression of TLRs 2, 3, 5, and 9. Next, the effect of stimulation with various TLR agonists on TLR expression levels was determined. Interestingly, microglia stimulated with poly(I:C), a synthetic dsRNA, did not increase expression of any of the TLRs, but decreased expression of all the TLRs, except for TLR3, which has been shown to bind dsRNA (13). Microglia stimulated with LPS, which is recognized by TLR4 in association with TLR2 and CD14 (14, 15), significantly increased expression of TLRs 2, 4, 6, 8, and 9. PG is recognized by TLR2 in association with TLR6 (12); however, PG-stimulated microglia did not increase expression of any of the TLRs. Microglia stimulated with CpG DNA increased expression of only TLR9, which recognizes CpG DNA (16). Expression and regulation of TLRs on microglia following virus infection and TLR ligation. Microglia were not stimulated, infected with TMEV, or stimulated with IFN-γ, poly(I:C), LPS, PG, or CpG DNA. Following 24 h of incubation, the cells were lysed, and RNA was isolated. Real-time PCR was conducted using primers specific for TLR1 (a), TLR2 (b), TLR3 (c), TLR4 (d), TLR5 (e), TLR6 (f), TLR7 (g), TLR8 (h), or TLR9 (i). Expression of the TLRs was measured in femtograms (fg), and quantities were normalized based on housekeeping genes. The horizontal line on the graph represents the level of expression in the unstimulated microglia. Asterisks indicate significant increases (>2-fold) in expression compared with the unstimulated microglia. These data are representative of five separate experiments. These results demonstrate that resting murine microglia express all nine known TLRs, indicating that these cells may be important mediators of innate immunity in the CNS capable of recognizing a myriad of microbial infections. Previously identified activators of microglia, IFN-γ or TMEV, increased expression levels of some TLRs, which suggests there is control of TLR expression upon activation similar to professional APCs. Interestingly, TMEV infection had a broad effect of increasing expression of multiple TLRs, including TLR3, which recognizes viral dsRNA. Microglia also increased expression of the TLRs upon recognition of PAMPs or TLR stimuli such as LPS and CpG DNA, which increased expression of their own receptors as well as a few additional TLRs. Most importantly, poly(I:C) decreased expression of all TLRs, except for its receptor, TLR3. Thus, stimulation through a TLR can have an effect on expression of the stimuli’s receptor or other receptors in either a positive or negative manner. As shown above, microglia express TLRs that recognize viral dsRNA and bacterial LPS, PG, and CpG DNA. Previous studies have shown that engagement of TLRs can result in expression of innate immune cytokines and proinflammatory cytokines that play a role in mediating the adaptive immune response (11). We have also shown that microglia express innate immune and proinflammatory cytokines following IFN-γ stimulation or TMEV infection (6). Therefore, microglia were exposed to TLR stimuli and examined for expression of innate immune cytokines to determine whether microglia can influence the adaptive immune response in the CNS following recognition of PAMPs via the innate immune response. Microglia were first examined by real-time PCR to determine the expression pattern of cytokine mRNA following TMEV infection or stimulation individually through various TLRs (Fig. 2⇓ and Table II⇓). With the exception of IL-6 and IL-18, microglia did not constitutively express mRNA at significant levels for any of the innate immune cytokines examined (Fig. 2⇓). Microglia were induced to express IFN-α4 following either virus infection or LPS stimulation. 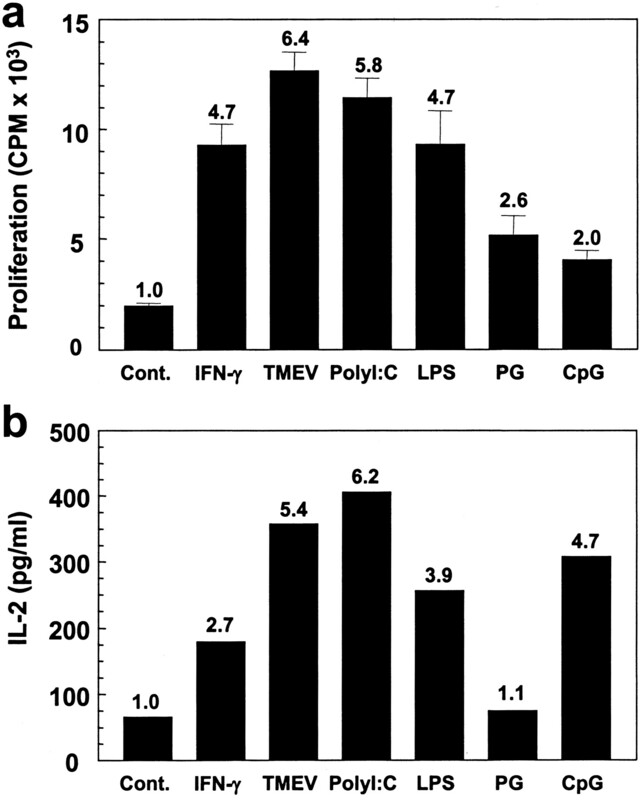 However, expression of IFN-β was most strongly induced following TMEV infection, but also following stimulation by poly(I:C), LPS, PG, or CpG DNA. Microglia were also induced to express IL-1β following stimulation via the various TLRs, as well as viral infection. Microglia expression of IL-6 and IL-12 was also up-regulated by all of the stimuli tested, but expression of IL-10 was only induced by TMEV infection and CpG DNA stimulation. The constitutive levels of expression of IL-18 were increased by IFN-γ treatment, TMEV infection, and stimulation with PG or CpG DNA. Microglia increased expression of TNF-α upon TMEV infection and by stimulation with LPS or PG, albeit at a lower level than TMEV infection or IFN-γ stimulation. Microglia increased iNOS expression upon TMEV infection or stimulation with LPS, PG, or CpG DNA. Thus, engagement of TLRs on microglia leads to increased expression of mRNA for innate immune and proinflammatory cytokines in distinct patterns. 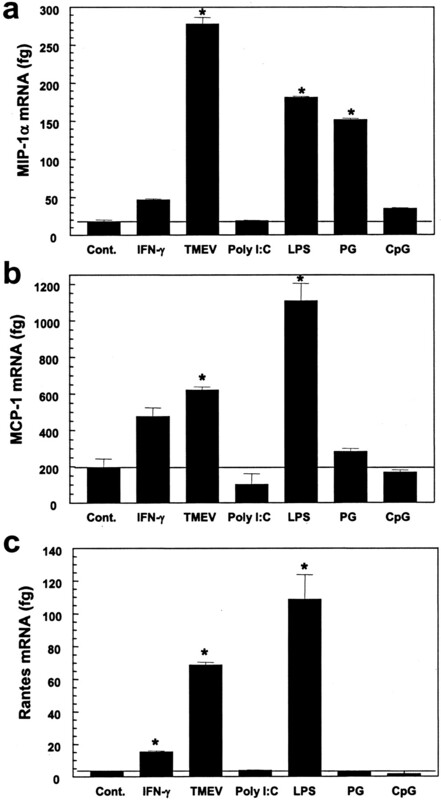 Overall, TMEV infection and LPS stimulation were the most efficient at eliciting up-regulation of cytokine mRNA, while poly(I:C) was generally the weakest inducer. Expression of mRNA for innate immune cytokines in microglia following virus infection and TLR ligation. Microglia were not stimulated, infected with TMEV, or stimulated with IFN-γ, poly(I:C), LPS, PG, or CpG DNA. Following 24 h of incubation, the cells were lysed, and RNA was isolated. Real-time PCR was conducted with primers specific for IFN-α4 (a), IFN-β (b), IL-1β (c), IL-6 (d), IL-10 (e), IL-12 (f), IL-18 (g), TNF-α (h), or iNOS (i). The mRNA expression was measured in femtograms (fg) following normalization and based on a standard curve for each primer pair. The horizontal line represents the level of expression in unstimulated microglia, and the asterisks indicate significant increases (>3-fold) in expression compared with the unstimulated microglia. These data are representative of five separate experiments. Microglial cells were next analyzed for secretion of innate immune and proinflammatory cytokine proteins following TMEV infection and stimulation with the various TLRs (Fig. 3⇓). Microglia did not secrete IL-1β constitutively, but secreted IL-1β upon exposure to all the TLR stimuli, with the highest levels induced by TMEV infection or LPS stimulation. Microglia constitutively secreted low levels of IL-6 and IL-10, which was increased upon TMEV infection or exposure to the various TLR agonists. Microglia did not produce IL-12 p70 constitutively; however, the levels were up-regulated significantly upon TLR stimulation or virus infection, with peak expression of the various stimuli occurring at different times depending on the nature of the stimulus. Microglia produced a low level of TNF-α without stimulation; however, expression was increased upon TLR stimulation or TMEV infection. Microglial culture supernatants had a basal level of GM-CSF due to the medium supplement, but secretion was increased following stimulation with LPS or CpG DNA or infection with TMEV. Overall, protein secretion correlated closely with mRNA expression with a few exceptions, which may be explained by translational differences in the stimulated cells. These results support the conclusion that stimulation of microglia with various TLR agonists leads to significant increases in expression and production of a variety of innate and proinflammatory cytokines. Production of innate immune cytokines by microglia following virus infection and TLR ligation. Microglia were not stimulated, infected with TMEV, or stimulated with IFN-γ, poly(I:C), LPS, PG, or CpG DNA. 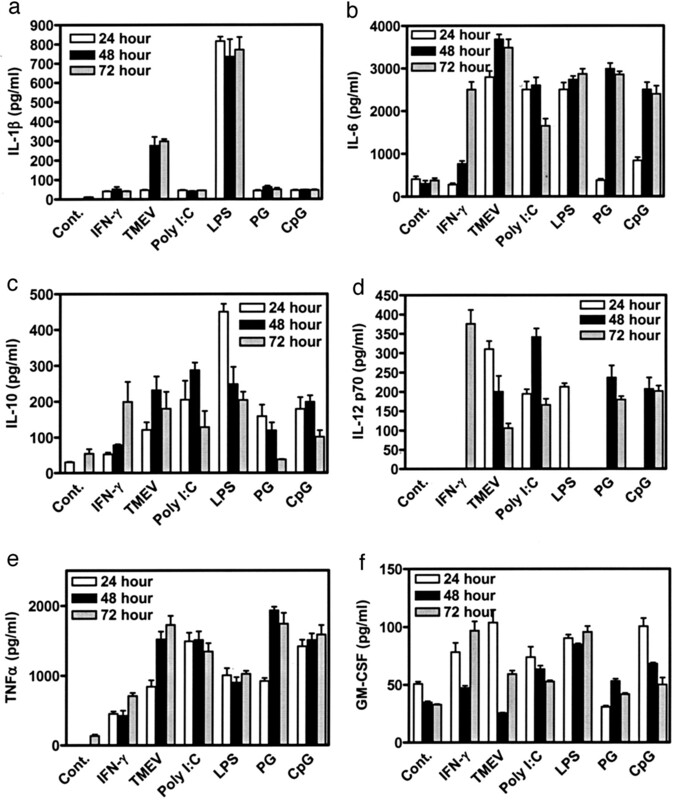 Supernatant was removed from the cultures at 24, 48, or 72 h and assayed for cytokine levels: IL-1β (a), IL-6 (b), IL-10 (c), IL-12p70 (d), TNF-α (e), and GM-CSF (f). These data are representative of three separate experiments. Following recognition of a pathogen infecting local tissue, cells of the innate immune system produce chemokines to attract professional APCs and T cells to the site of infection. These infiltrating cells function in the effector limb of the adaptive immune response to clear the pathogen from the host. Microglia were thus analyzed for expression of chemokine mRNA following TMEV infection and TLR stimulation (Fig. 4⇓). Unstimulated microglia secreted significant levels of MCP-1 constitutively, but secreted MIP-1α and RANTES at very low levels. Microglia infected with TMEV or stimulated with LPS significantly increased expression of mRNA for all three chemokines. Microglia stimulated with PG increased expression of MIP-1α, but not MCP-1 or RANTES. Interestingly, stimulation with either poly(I:C) (TLR3) or CpG DNA (TLR9) did not lead to increased chemokine expression, and IFN-γ stimulation only induced marginal up-regulation of chemokine expression. Therefore, recognition of pathogens by microglia through various TLRs up-regulated expression of mRNA for various chemokines that aid in the recruitment of professional APCs and effector T cells to the CNS. Expression of chemokine mRNA in microglia following virus infection and TLR ligation. Microglia were not stimulated, infected with TMEV, or stimulated with IFN-γ, poly(I:C), LPS, PG, or CpG DNA. Following 24 h of incubation, the cells were lysed, and RNA was isolated. Real-time PCR was performed with primer pairs specific for MIP-1α (a), MCP-1 (b), and RANTES (c). The mRNA expression for each chemokine was measured in femtograms (fg) based on a standard curve for each primer pair. The horizontal line on the graph represents the level of chemokine expression by unstimulated microglia, and the asterisks indicate significant increases (>3-fold) in expression compared with the unstimulated microglia. These data are representative of five separate experiments. We have previously reported that microglia up-regulate MHC class I, MHC class II, and costimulatory molecules following TMEV infection or activation with IFN-γ (6). Therefore, microglia were examined for expression of these crucial molecules involved in Ag presentation to T cells following stimulation through the TLRs (Fig. 5⇓). Microglia were exposed to the various TLR stimuli and examined by flow cytometry for cell surface expression of various APC-dependent molecules. Microglia expressed CD45 at an intermediate level, which has previously been identified as a unique distinguishing feature between microglia and macrophages, in which macrophages express high levels of CD45 (21, 22). Microglia also constitutively expressed the macrophage markers CD11b or Mac-1. However, resting microglia did not constitutively express significant levels of the costimulatory molecules, B7-1, B7-2, ICAM-1, or CD40, nor did they express detectable levels of MHC class I or II. Microglia infected with TMEV or stimulated with poly(I:C), LPS, and CpG DNA increased expression of all the costimulatory molecules, as well as MHC class I and II. Microglia stimulated with PG increased expression of the costimulatory molecules, but at a lower level than the other stimuli, and also only marginally increased expression of MHC class I and II. Therefore, to various levels, ligation of TLRs 2, 3, 4, and 9 on microglia increased expression costimulatory and MHC molecules required for T cell activation. Expression of MHC class I, MHC class II, and costimulatory molecules following TLR stimulation. Microglia were not stimulated, infected with TMEV, or stimulated with IFN-γ, poly(I:C), LPS, PG, or CpG DNA. Following 24 h of incubation, the cells were stained with Abs specific for cell surface markers: CD45 (a), CD11b (b), B7-1 (CD80) (c), B7-2 (CD86) (d), ICAM-1 (CD54) (e), CD40 (f), H2Ks (MHC class I) (g), or I-As (MHC class II) (h). The cells were analyzed on a FACSCalibur, and mean fluorescence shift was determined for each marker following subtraction of fluorescence for the appropriate isotype control. These data are representative of five separate experiments. Because microglia increased expression of costimulatory molecules and MHC class II following stimulation with various TLRs, the functional consequences of TLR engagement were next determined. Microglia were exposed to the various TLR stimuli or infected with TMEV and then examined for their ability to present the immunodominant myelin PLP epitope, PLP139–151, to a peptide-specific CD4+ T cell line or CD4+ T cell hybridoma (Fig. 6⇓). Following stimulation with IFN-γ or TMEV infection, peptide-pulsed microglia could activate proliferation of a costimulation-dependent PLP139–151-specific CD4+ T cell line (Fig. 6⇓a) and IL-2 secretion by a PLP139–151-specific CD4+ T cell hybridoma (Fig. 6⇓b). Similarly, microglia stimulated with poly(I:C), LPS, or CpG DNA also were induced to serve as efficient APCs. However, microglia stimulated with PG were not efficient in activation proliferation or IL-2 production, correlating with the lower levels of MHC class II expression (Fig. 5⇑) compared with the other TLR stimuli. Therefore, ligation of TLR 2, 3, and 9 activates microglia to differentiate into functional APCs capable of inducing proliferation and IL-2 production by CD4+ Th1 cells. TLR ligation induces APC function of CNS microglia. Microglia were not stimulated, infected with TMEV, or stimulated with IFN-γ, poly(I:C), LPS, PG, or CpG DNA for 24 h. The cells were then washed, irradiated, and incubated with a PLP139–151-specific CD4+ Th1 line (5 × 104 cells) and 10–50 μM PLP139–151 peptide (a) for 96 h with a [3H]TdR pulse for the last 24 h. Proliferation was measured as the cpm for triplicate wells. The numbers above the bar represent the stimulation index. Alternatively, microglia were incubated with a PLP139–151-specific CD4+ T cell hybridoma (5 × 104 cells) for 72 h (b). The supernatants were removed and analyzed for IL-2 secretion. The numbers above the bar graphs represent the fold increase in IL-2 secretion over the unstimulated microglia. These data are representative of three separate experiments. Microglia are the resident macrophage-like population of the CNS, where infiltration of peripheral macrophages and lymphocytes is restricted until infection or injury generates signals leading to cellular infiltration. Thus, CNS-resident cells such as microglia, and possibly astrocytes, represent the first line of defense against invading pathogens and potentially provide innate immune signals leading to subsequent adaptive immune responses. The present studies were designed to determine whether microglia can recognize pathogens via innate immune receptors (TLRs) and whether this recognition led to functional consequences such as up-regulation of production of innate immune cytokines and other critical molecules involved in Ag presentation. Remarkably, microglia were shown to express all nine of the TLRs reported to date in mice, TLR1–9, and responded to TLR stimuli, including PG (TLR2), poly(I:C) (TLR3), LPS (TLR4), and CpG DNA (TLR9), by expressing unique patterns of innate immune cytokines and chemokines. We have previously shown that microglia can be activated upon stimulation with proinflammatory cytokines, e.g., IFN-γ, or infection with viable TMEV, to become competent APCs. The current results further demonstrate that activation of microglia with a variety of TLR stimuli increased expression of proinflammatory cytokines as well as up-regulated costimulatory molecules and MHC class II, which enabled the microglia to present myelin peptide to CD4+ Th1 cells. The innate immune response is directed at identifying pathogens as nonself by recognizing PAMPs through TLRs (23). TLR2 recognizes PG and associates with TLR1 to recognize triacyl lipopeptide and TLR6 to recognize diacyl lipopeptides (12). TLR3 recognizes dsRNA found primary in viruses (13). TLR4 recognizes LPS in association with LPS-binding protein, CD14, and MD-2 (12). TLR5 recognizes flagellin from bacteria, and TLR7 recognizes imidazoquinoline, which is a synthetic molecule (24, 25). The agonist for TLR8 is unknown, while TLR9 recognizes bacterial CpG DNA (16). The broad expression pattern of mRNA for all of the identified murine TLRs in cultured microglia and the functional activation of these cells following stimulation with four separate TLR agonists suggests that microglia play an important role in the innate immune response in the CNS, an organ without an organized lymphatic drainage system. TLRs are expressed on a variety of cells; however, most cells have preferential expression of TLRs. Monocytes/macrophages have been shown to express most TLRs during different stages of maturation, but apparently do not express TLR3 (26). Dendritic cell expression of TLRs is dependent on the subset of dendritic cell and on their maturation state. Immature dendritic cells express TLR1, 2, 4, and 5; however, expression of these TLRs decreases upon maturation and TLR3 expression is induced (27). Immature dendritic cells mature in response to microbial components such as LPS and PG, inducing the expression of proinflammatory cytokine, IL-12, and costimulatory molecules, B7-1 and B7-2 (12). Studies conducted on human tissue showed that the brain expressed TLR1–5, 7, 9, and 10; however, the levels in the brain were much lower than those observed in the spleen (28). Additional studies in humans showed that microglia isolated from the adult brain expressed TLR1–8, but did not express TLR9, while astrocytes and oligodendrocytes only expressed TLR2 and TLR3 (29). The results from our studies show that microglia isolated from mice expressed all the TLRs and support a previous study showing expression of TLR9 by murine microglia (30). Thus, murine microglia appear similar to human microglia, except for their expression of TLR9. However, it should be emphasized that our studies were conducted in vitro, using cultured neonatal microglia; thus, TLR expression may differ in the CNS environment. Studies are currently underway using FACS-purified microglia from naive mice and mice with CNS inflammatory disease to compare the in vitro results with in vivo model systems. TLRs signal through a common adaptor protein, MyD88, which binds to the conserved domain on the TLRs. Following stimulation, MyD88 activates IL-1R-associated kinase, which associates with TNFR-associated factor 6, leading to activation of NF-κB family of transcription factors (31). However, MyD88-independent pathways have also been identified, including activation of IFN regulatory factor-3, resulting in expression of several IFN-inducible genes (32, 33). Thus, engagement of the TLRs leads to transcriptional activation of cytokines, chemokines, effector molecules, and APC surface molecules. We show that microglia stimulated through the TLRs 2, 3, 4, and 9 increased expression of cytokines, chemokines, and other effector molecules, as well as costimulatory molecules and MHC class I and II molecules. Our results thus confirm and extend a previous study showing that murine microglia responded to CpG DNA by inducing expression of TNF-α and IL-12 p70, as well as costimulatory molecules and MHC class II (30). Interestingly, microglia responded most strongly to infection with viable TMEV compared with stimulation through the various individual TLRs, including poly(I:C) stimulation (TLR3), which recognizes viral dsRNA. This suggests that the virus may activate innate immunity via multiple TLRs or that there may be additional mechanisms, known or unknown, for triggering of innate immune recognition. For example, dsRNA-activated protein kinase has been shown to bind intracellular dsRNA produced during virus infection, resulting in the expression of type I IFNs (34, 35). In addition, recent studies have shown that viruses can be recognized by TLRs other than TLR3. The inflammatory immune response to respiratory syncytial virus and mouse mammary tumor virus has been shown to be dependent on TLR4 (36, 37, 38). Human CMV has been shown to be recognized by TLR2 and CD14, stimulating inflammatory cytokine production (39). Therefore, infection with a positive-strand RNA virus such as TMEV may activate the microglia through several innate immune response receptors, leading to a more robust innate immune response compared with stimulation through individual TLRs. However, stimulation of microglia with a combination of LPS and poly(I:C) did not induce a significantly stronger response than either stimuli alone (data not shown). Our studies show a direct link between the innate immune response by microglia and their ability to become effective APCs. Microglia stimulated with the various TLR agonists expressed innate immune and proinflammatory cytokines, including IL-12, IL-18, and TNF-α, which promote Th1-type proinflammatory responses. In addition, TLR activation induced microglial expression of chemokines (MIP-1α, MCP-1, and RANTES), which are required for attracting peripheral macrophages and T cells to the CNS. Most importantly, microglia activation via TLR agonists up-regulated expression of costimulatory molecules (B7-1, B7-2, CD40, and ICAM-1) and MHC class II, which enabled the cells to functionally present Ag to CD4+ Th1 cells. Thus, microglial recognition of pathogens through various TLRs induced potent innate immune responses, which collectively promote proinflammatory T cell responses in the CNS, where the activated microglia present Ag to infiltrating effector T cells. The other glial cells within the CNS, such as astrocytes and oligodendrocytes, may also aid in the innate immune response; however, microglia appear to be the most potent CNS-resident APC (40). Collectively, these studies suggest a critical role for microglia in the innate immune response to CNS pathogens, leading to the activation of adaptive immune functions, most importantly Ag presentation capacity. Microglia have been suggested to play a role in MS, a human T cell-mediated autoimmune demyelinating disease (5). MS has been suggested to be initiated and/or exacerbated by infections, particularly in the CNS (4). Thus, the innate immune response to pathogens infecting the CNS may play an important role in the development and/or exacerbation of the underlying autoimmune response, in which triggering of proinflammatory cytokine production by the microglial innate immune response may play an important role. Microglia produced chemokines following TLR stimulation that would aid in attracting autoreactive and other peripheral inflammatory T cells to the CNS and TNF-α, which has been implicated in direct destruction of myelin (41). This cytokine-mediated release of endogenous myelin Ags along with the observation that microglia activated through their innate immune receptors can effectively present myelin Ags to autoreactive CD4+ Th1 cells indicate that microglia may play a role in both the initiation of autoreactive T cell responses following CNS infection and/or promotion of chronic disease via the phenomenon of epitope spreading (10). We thank Wendy Smith-Begolka and Pam Carpentier for their technical assistance. ↵1 This work was supported in part by U.S. Public Health Service National Institutes of Health Grants NS-23349, NS-40460, and NS-30871, and by National Multiple Sclerosis Society Grant RG-3629-A-2. ↵3 Abbreviations used in this paper: MS, multiple sclerosis; iNOS, inducible NO synthase; PAMP, pathogen-associated molecular pattern; PG, peptidoglycan; PLP, proteolipid protein; poly(I:C), polyinosinic-polycytidylic acid; TMEV, Theiler’s murine encephalomyelitis virus. Federoff, S.. 1995. Development of microglia. H. Kettenmann, and B. R. Ransom, eds. Neuroglia 162. Oxford University Press, Oxford. Kreutzberg, G. W.. 1996. Microglia: a sensor for pathological events in the CNS. Trends Neurosci. 19:312. Shrikant, P., E. N. Benveniste. 1996. The central nervous system as an immunocompetent organ: role of glial cells in antigen presentation. J. Immunol. 157:1819. Kurtzke, J. F.. 1993. Epidemiologic evidence for multiple sclerosis as an infection. Clin. Microbiol. Rev. 6:382. Aloisi, F., F. Ria, L. Adorini. 2000. Regulation of T-cell responses by CNS antigen-presenting cells: different roles for microglia and astrocytes. Immunol. Today 21:141. Olson, J. K., A. M. Girvin, S. D. Miller. 2001. Direct activation of innate and antigen presenting functions of microglia following infection with Theiler’s virus. J. Virol. 75:9780. Clatch, R. J., S. D. Miller, R. Metzner, M. C. Dal Canto, H. L. Lipton. 1990. Monocytes/macrophages isolated from the mouse central nervous system contain infectious Theiler’s murine encephalomyelitis virus (TMEV). Virology 176:244. Lipton, H. L., G. Twaddle, M. L. Jelachich. 1995. The predominant virus antigen burden is present in macrophages in Theiler’s murine encephalomyelitis virus-induced demyelinating disease. J. Virol. 69:2525. Miller, S. D., S. J. Gerety. 1990. Immunologic aspects of Theiler’s murine encephalomyelitis virus (TMEV)-induced demyelinating disease. Semin. Virol. 1:263. Miller, S. D., C. L. Vanderlugt, W. S. Begolka, W. Pao, R. L. Yauch, K. L. Neville, Y. Katz-Levy, A. Carrizosa, B. S. Kim. 1997. Persistent infection with Theiler’s virus leads to CNS autoimmunity via epitope spreading. Nat. Med. 3:1133. Medzhitov, R., C. A. Janeway, Jr. 1997. Innate immunity: impact on the adaptive immune response. Curr. Opin. Immunol. 9:4. Takeda, K., T. Kaisho, S. Akira. 2003. Toll-like receptors. Annu. Rev. Immunol. 21:335. Alexopoulou, L., A. C. Holt, R. Medzhitov, R. A. Flavell. 2001. Recognition of double-stranded RNA and activation of NF-κB by Toll-like receptor 3. Nature 413:732. Qureshi, S. T., L. Lariviere, G. Leveque, S. Clermont, K. J. Moore, P. Gros, D. Malo. 1999. Endotoxin-tolerant mice have mutations in Toll-like receptor 4 (Tlr4). J. Exp. Med. 189:615. Hemmi, H., O. Takeuchi, T. Kawai, T. Kaisho, S. Sato, H. Sanjo, M. Matsumoto, K. Hoshino, H. Wagner, K. Takeda, S. Akira. 2000. A Toll-like receptor recognizes bacterial DNA. Nature 408:740. Brostoff, S. W., W. Reuter, M. Hichens, E. H. Eylar. 1974. Specific cleavage of the A1 protein from myelin with cathepsin D. J. Biol. Chem. 249:559. Tan, L. J., K. B. Gordon, J. P. Mueller, L. A. Matis, S. D. Miller. 1998. Presentation of proteolipid protein epitopes and B7-1-dependent activation of encephalitogenic T cells by IFN-γ-activated SJL/J astrocytes. J. Immunol. 160:4271. Olson, J. K., S. S. Zamvil, S. D. Miller. 2003. Efficient technique for immortalization of murine microglial cells relevant for studies in murine models of multiple sclerosis. J. Neurosci. Methods 128:33. Lipton, H. L., A. Friedmann. 1980. Purification of Theiler’s murine encephalomyelitis virus and analysis of the structural virion polypeptides: correlation of the polypeptide profile with virulence. J. Virol. 33:1165. Ford, A. L., A. L. Goodsall, W. F. Hickey, J. D. Sedgwick. 1995. Normal adult ramified microglia separated from other central nervous system macrophages by flow cytometric sorting: phenotypic differences defined and direct ex vivo antigen presentation to myelin basic protein-reactive CD4+ T cells compared. J. Immunol. 154:4309. Carson, M. J., C. R. Reilly, J. G. Sutcliffe, D. Lo. 1998. Mature microglia resemble immature antigen-presenting cells. Glia 22:72. Medzhitov, R., P. Preston-Hurlburt, C. A. Janeway, Jr. 1997. A human homologue of the Drosophila Toll protein signals activation of adaptive immunity. Nature 388:394. Hayashi, F., K. D. Smith, A. Ozinsky, T. R. Hawn, E. C. Yi, D. R. Goodlett, J. K. Eng, S. Akira, D. M. Underhill, A. Aderem. 2001. The innate immune response to bacterial flagellin is mediated by Toll-like receptor 5. Nature 410:1099. Hemmi, H., T. Kaisho, O. Takeuchi, S. Sato, H. Sanjo, K. Hoshino, T. Horiuchi, H. Tomizawa, K. Takeda, S. Akira. 2002. Small anti-viral compounds activate immune cells via the TLR7 MyD88-dependent signaling pathway. Nat. Immunol. 3:196. Muzio, M., D. Bosisio, N. Polentarutti, G. D’Amico, A. Stoppacciaro, R. Mancinelli, C. van’t Veer, G. Penton-Rol, L. P. Ruco, P. Allavena, A. Mantovani. 2000. Differential expression and regulation of Toll-like receptors (TLR) in human leukocytes: selective expression of TLR3 in dendritic cells. J. Immunol. 164:5998. Visintin, A., A. Mazzoni, J. H. Spitzer, D. H. Wyllie, S. K. Dower, D. M. Segal. 2001. Regulation of Toll-like receptors in human monocytes and dendritic cells. J. Immunol. 166:249. Zarember, K. A., P. J. Godowski. 2002. Tissue expression of human Toll-like receptors and differential regulation of Toll-like receptor mRNAs in leukocytes in response to microbes, their products, and cytokines. J. Immunol. 168:554. Bsibsi, M., R. Ravid, D. Gveric, J. M. van Noort. 2002. Broad expression of Toll-like receptors in the human central nervous system. J. Neuropathol. Exp. Neurol. 61:1013. Dalpke, A. H., M. K. Schafer, M. Frey, S. Zimmermann, J. Tebbe, E. Weihe, K. Heeg. 2002. Immunostimulatory CpG-DNA activates murine microglia. J. Immunol. 168:4854. Takeda, K., S. Akira. 2003. Toll receptors and pathogen resistance. Cell Microbiol. 5:143. Malakhova, O., M. Malakhov, C. Hetherington, D. E. Zhang. 2002. Lipopolysaccharide activates the expression of ISG15-specific protease UBP43 via interferon regulatory factor 3. J. Biol. Chem. 277:14703. Yang, Y. L., L. F. Reis, J. Pavlovic, A. Aguzzi, R. Schafer, A. Kumar, B. R. Williams, M. Aguet, C. Weissmann. 1995. Deficient signaling in mice devoid of double-stranded RNA-dependent protein kinase. EMBO J. 14:6095. Balachandran, S., P. C. Roberts, L. E. Brown, H. Truong, A. K. Pattnaik, D. R. Archer, G. N. Barber. 2000. Essential role for the dsRNA-dependent protein kinase PKR in innate immunity to viral infection. Immunity 13:129. Kurt-Jones, E. A., L. Popova, L. Kwinn, L. M. Haynes, L. P. Jones, R. A. Tripp, E. E. Walsh, M. W. Freeman, D. T. Golenbock, L. J. Anderson, R. W. Finberg. 2000. Pattern recognition receptors TLR4 and CD14 mediate response to respiratory syncytial virus. Nat. Immunol. 1:398. Haynes, L. M., D. D. Moore, E. A. Kurt-Jones, R. W. Finberg, L. J. Anderson, R. A. Tripp. 2001. Involvement of Toll-like receptor 4 in innate immunity to respiratory syncytial virus. J. Virol. 75:10730. Rassa, J. C., J. L. Meyers, Y. Zhang, R. Kudaravalli, S. R. Ross. 2002. Murine retroviruses activate B cells via interaction with Toll-like receptor 4. Proc. Natl. Acad. Sci. USA 99:2281. Compton, T., E. A. Kurt-Jones, K. W. Boehme, J. Belko, E. Latz, D. T. Golenbock, R. W. Finberg. 2003. Human cytomegalovirus activates inflammatory cytokine responses via CD14 and Toll-like receptor 2. J. Virol. 77:4588. Aloisi, F., F. Ria, G. Penna, L. Adorini. 1998. Microglia are more efficient than astrocytes in antigen processing and in Th1 but not Th2 activation. J. Immunol. 160:4671. Selmaj, K. W., C. S. Raine. 1988. Tumor necrosis factor mediates myelin and oligodendrocyte damage in vitro. Ann. Neurol. 23:339.